JACKSON HOLE, WY – Chrysler Group LLC’s Jeep brand has the right lineup to meet customer demand, despite escalating prices at the pump, a top official says. Taken together with Jeep’s 4-cyl. Compass and Patriot, the Pentastar’s rollout “shows we have a very solid plan for any uptick in fuel prices,” he says. The auto maker says highway fuel economy for the Compass and Patriot tops out at 29 mpg (8.1 L/100 km) when fitted with the base 2.0L 4-cyl. engine, front-wheel drive and 5-speed manual transmission, while the Grand Cherokee powered by the Pentastar engine, plus FWD and 5-speed automatic, nets 23 mpg (10.2 L/100 km). U.S. pump prices were low enough through most of 2010 to allow consumers to flock to light trucks. SUV sales climbed 12.2% through November, compared with year-ago, according to Ward’s data, while CUV deliveries jumped 22.6%. Jeep sales in the period climbed 23%, with a rich mix of SUVs and CUVs, Manley says. So much so that brand officials now believe they can push price-points even higher. “Where (the Grand Cherokee) really has exceeded all of our expectations is in the fullsize SUV (segment) – above the $40,000 bracket,” Manley says, adding dealers report most of these models have sold out. 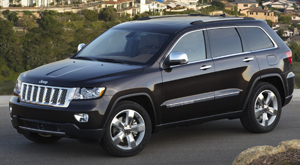 To further woo well-heeled buyers, Jeep shortly will introduce the Grand Cherokee Overland Summit model. “We just don’t know where the ceiling is,” Manley says of the SUV. The Grand Cherokee Overland Summit has 20-in. bright polished aluminum wheels and an exclusive brown exterior paint. Inside, it boasts saddle leather seating and upper trim, black- olive, burled-wood trim and a wood-and-leather heated steering wheel. Jeep says the Overland Summit will ride like a luxury car on road, but retains its off-road capability thanks to a stiff chassis plus standard Quadra-Lift air-suspension system and Selec-Terrain’s five drive modes. Jeep also believes the sky is the limit for its iconic Wrangler. “We do think there’s an opportunity with this vehicle to stretch a little more premium,” says Chris Ellis, head of Wrangler marketing. To that end, Jeep has updated the Wrangler’s interior, adding armrests “you can actually put your arm on,” jokes Jeep chief designer Mike Allen. Additionally, Sahara models have a body-color hardtop. All ’11 Wranglers get more soft-touch materials, as well as available heated exterior mirrors. Pricing for the ’11 Grand Cherokee Overland Summit ranges from about $43,000-$46,000 for 2- and 4-wheel drive. However, added options can boost the price of the 4x4 model to just under $50,000. The price tag for the ’11 Wrangler is $22,000-$25,000, jumping to $38,000 for the 4x4 Unlimited model with all available options.